The Tri-County area is fortunate to have over 150 beautiful parks and trails, with amenities ranging from walking paths and playgrounds to boating and fishing. These are all wonderful places to get out and get active! They can be used by anyone who seeks the serenity of nature, the excitement of recreation, or a walk in the woods beside a river or lake. We are excited to introduce a NEW brochure featuring 36 destination parks and trails throughout the Tri-County area. 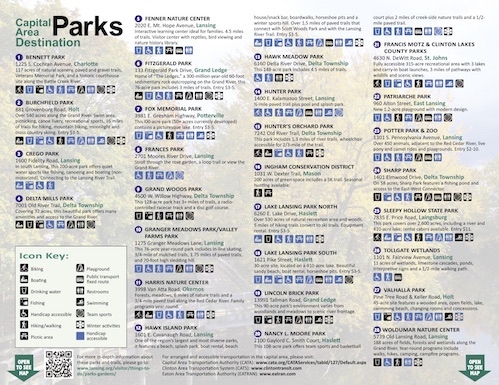 Thanks to the work of our many partners during the first half of 2014, the Alliance has developed a brochure that can easily fit into your purse, briefcase, or glovebox but that also folds out to show a map with the parks and trails locations as well as a description of each of the listed parks and trails. 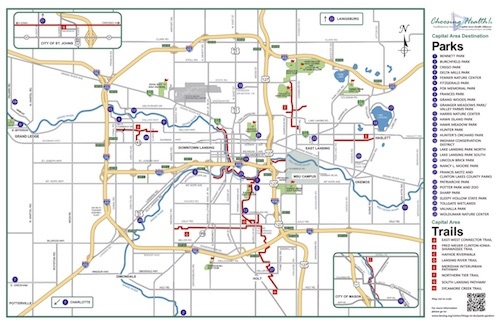 These Capital Area Parks & Trails Brochures will be available at your local parks and parks departments, community centers, health departments, and neighborhood organizations. You can also view and download the brochure below! NOTE: You can download the entire brochure in one file here, or the individual, higher-resolution pages above (recommended). to these medical practices that have taken and distributed Capital Area Parks & Trails Brochures.